Political analysts are engaged in a wild melee trying to predict the twists and turns of Senator John McCain's political gyrations. Some say he will switch parties, some predict another run for the presidency. Regardless of the final outcome, certain lessons can already be learned about what happens when a politician turns against his political base. Consider the fact that Arizona is a hotbed of pro-gun sentiment. In past elections, Arizona gun owners have rewarded McCain's support of gun rights with thousands of reliable votes, yet he has recently chosen to thumb his nose at them not once, but three times. First he allied himself with Americans for Gun Safety, an anti-gun organization funded by billionaire Andrew McKelvey. 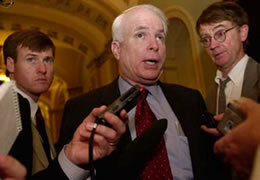 McCain appeared in the group's television ads that pushed through anti-gun initiatives in Oregon and Colorado. He attacked the National Rifle Association with his campaign finance reform bill that would make it illegal for organizations like the NRA to communicate political information to their members before an election. Federal incarceration would await violators who attempt to exercise their first amendment rights. Together with Senator Joe Lieberman, he sponsored a gun show bill that would bury gun owners under a mountain of red tape and invest the Secretary of the Treasury with unlimited power to regulate gun shows. Even inadvertent violations would be punished with federal prison time. gun-bashing supporter of greater government power. Representatives of some of Arizona's many gun rights groups offered their comments for this column. Memorial Day speech by Arizona's other senator, Jon Kyl, in which the mere mention of McCain garnered a chorus of boos and grumbling from the crowd of veterans and their families. Angel Shamaya, director of KeepAndBearArms.com wrote: "Senator John McCain has effectively burned his bridge with gun owners in Arizona. His jumping in bed with the billionaire-funded 'Americans for Gun Safety' organization was the last straw". Alan Korwin of Gunlaws.com performed a comprehensive analysis of the McCain-Lieberman gun show bill and pointed out the many disturbing aspects. He writes: "What makes a person turn 360 degrees like this? He has become an anti-rights bigot, trashing the first and second amendments, and then lying publicly about what his bills do. Which is worse -- he doesn't know what's in his bills, or he does?" Ken Rineer, President of the Firearms Action Committee of Tucson says: "McCain cares about one thing and one thing only -- himself! He likes all the attention he is getting and this is fueling him to continue, but I think he has miscalculated. Gun owners are mad as hell! His vote against tax cuts, coupled with his anti-free speech and anti-gun show bills, have created quite a coalition of very unhappy constituents. My contacts report that his staff has become hostile towards callers who complain about what McCain is doing". These are some of the milder comments from Arizona gun rights activists. Others announce their anger in more rancorous terms. Words like traitor and turncoat are commonly used to describe the wayward senator. The term "Manchurian Candidate" is being used as an epithet to indicate how bizarre McCain's behavior appears to Arizona gun owners who feel betrayed by his defection. Many journalists and politicians are afraid to criticize the powerful senator, but gun owners have a habit of speaking their mind and are a useful indicator of grassroots opinion. In Arizona they are not shy about attributing his political instability to an inflated ego, a lust for higher office, and a need for attention. During the last presidential election, many voters admired McCain's defense of freedom as an aviator and a POW. His attacks on the first and second amendments are now alienating many of those supporters, especially those with military service who swore an oath to defend the Constitution. His self-serving antics have also made enemies of some powerful organizations at the national level. If McCain is considering another presidential bid, he is going about it in a very odd way. He may be planning to replace his former backers with new interest groups, but there is no reason for those new groups to trust a man who has already proven to be an unreliable ally. Dr. Michael S. Brown is an optometrist, a member of Doctors for Sensible Gun Laws, and writes frequent commentaries about the American gun debate.